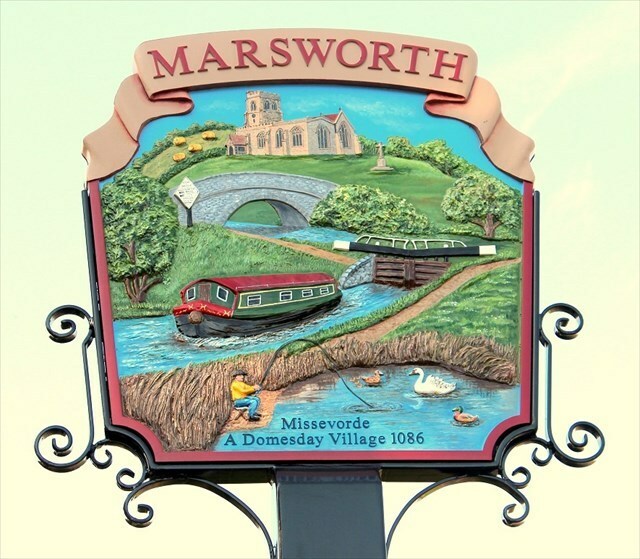 The idea of a village sign for Marsworth was put to the Parish Council in early 2016, but when they failed to get funding for it, a group of locals banded together and rallied the villagers and some local organisations into raising the £4400 or so needed for the sign, themselves. There are so many historic features in the village, there just wouldn't be room for them all on the Sign. The main feature that they all agreed on was the CANAL, which had the biggest impact in Marsworth’s history when it was built and continues to be popular with locals, visitors, boaters and fishermen today. It runs right through the middle of the Parish, which could have split it in two when it was built. But no, they also got bridges to hold the community together. So a BRIDGE was a must for the sign. There are 12 locks in Marsworth of which 7 enable boats to travel up and down the side of the Chiltern Hills – represented by the LOCK in the picture. The DIAMOND SIGN is a reminder of a bygone age before Lorries and heavy vehicles trundled across the bridges. Marsworth is proud to have its own CHURCH, All Saints, which draws the community together. Marsworth’s roots are in farming which you will see here with the FIELDS OF HAY in the background. The RESERVOIRS, cannot be ignored as they are essential to control the water levels in the canal, and that while they are only partially in the Parish, they draw people from miles away to Marsworth with their wildlife, walks and excellent FISHING. Finally, Marsworth has existed since at least 975 AD and it was recorded in the DOMESDAY BOOK in 1086, when the village was then called MISSEVORDE, meaning, Maessa’s Inclosure. Happily it all came together and according to a local newspaper report, the sign, built by a local company Signs of the Times was unveiled on Sat June 2017 by the High Sherriff of Buckinghamshire, Mr Peter Kara. You are looking for a small container in a cammo bag. As this is a Letterbox cache, please do not remove the Stamp. Please be careful with Small Cachers and Dogs as the road that the VS is sited on can be busy. Number of Ducklings = A. Number of Swans = B. Number of Lower case letters = CD. The Third digit of the Date = E.
The number of times the letter N appears = F.
The number of letters in the 14th word of the inscription = G.
The Month mentioned = H.
The number of years that they lived in the cottage = J . Happy Hunting and please try not to leave a cachers trail at GZ - Thank You!